If you live in a wooded area or are a frequent visitor to the forests, then you most likely know how to spot various poisonous plants, such as poison ivy, poison oak, and poison sumac. Sure, you could wear long pants, but what about during the summer? Or what do you do if this fiend makes it into your garden? When you find poison ivy encroaching on your bright and pretty flowers and manicured lawns, it’s time to act. But what can do you without also hurting your other plants? Luckily enough, there are plenty of homemade poison ivy killer recipes that you can use to help save your yard. Whether this is your first time dealing with poison ivy, or your tenth, you are sure to learn something that can help you keep your flower beds happy and healthy. You can make many of the DIY poison ivy killer tips, tricks, and recipes in this article with things you already have around the house. And even better, these recipes can be used on other poison plants. However, no matter which method you choose, if you know you are allergic to poison ivy, be sure to wear long pants and gloves, so you don’t find yourself with a painful and itchy rash. Believe it or not, poison ivy cannot withstand boiling water. Fill your kettle with water, let it boil, and then take it outside and pour it at the base of the plant at ground level. The boiling water will burn the roots, and so they won’t be able to function correctly. You will likely need to do this a couple of times a day for a few days before you see results, but it is a very easy, and one of the most natural ways, to kill poison ivy plants. If you are one of those lucky few who is not allergic to poison ivy, you can always pull the plant out itself. However, if you do choose this method, be sure to get all the way down to the root. Otherwise, the plant could develop new growth and pop up again or somewhere else. The best way to make sure you get all of the plant’s roots is to dig it up. Sometimes the roots can reach as deep as eight inches. If you’d like to try another approach where you won’t risk adding anything to the soil and messing up the pH levels, you can try and work from the ground up. You can carefully try to smother the plant. To do this, you could either tie a plastic bag around the leaves of the plant or cover the plant with cardboard. This method will keep the necessary carbon dioxide and sunlight from getting to the plant. If you have a cluster of poison ivy, poison oak, or poison sumac, you can follow this industrious recipe to kill the plants. Only use this if there are not any plants you want to save nearby, as enough of this could potentially destroy any plant. Pour the salt into the water and stir until fully dissolved. Then, add the dish soap. Pour the mixture into a spray bottle and spray the homemade poison ivy killer onto the leaves of the plants. The sheer amount of salt in this recipe will not only dehydrate the poison plants but also make it more difficult for the roots to soak up necessary nutrients. If you have some cheap gin that you don’t mind sacrificing, you can use it to deal with your poison plant problem. 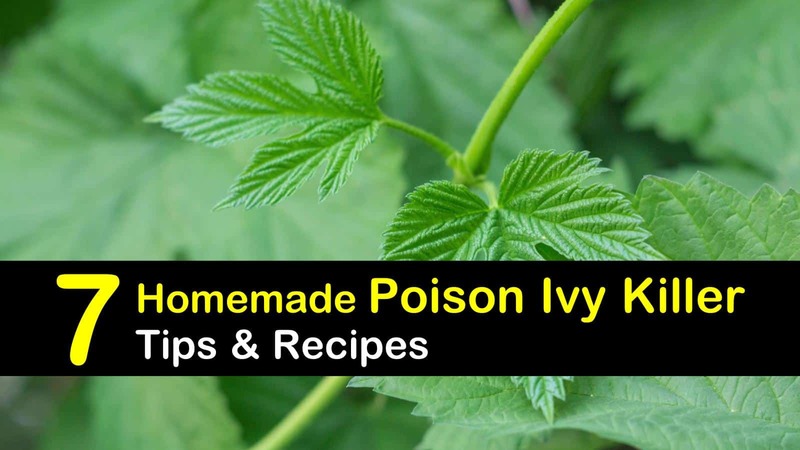 Here is what you need to make this homemade poison ivy killer. Mix the ingredients and then transfer to a spray bottle. Spray the homemade poison oak killer onto the leaves of the plant. If it doesn’t work by the next day, then respray the leaves. This homemade poison oak killer can also work on other poison plants and kill weeds if you’re having a problem. If the poisonous plants are growing near your other plants, you’re going to need a new plan of attack. Vinegar, the all-purpose cleaner agent, can help out in the garden as well. However, you are going to need undiluted white vinegar to achieve the best results and prevent new growth. Pour the white vinegar into a spray bottle and spray the leaves of the plant until they are near saturated. You don’t, however, want to spray the ground as too much vinegar may alter the acidity of the soil and prevent plants from growing successfully in the future. However, vinegar is also an instrumental weed killer and can help you with weed control. If you’re wondering, “Will vinegar hurt plants?” It all depends on how you use it. Vinegar can do damage if not carefully controlled. However, there are plenty of plant species that thrive in higher acidity soils. If straight vinegar didn’t work and your plants are near other plants, you may need a little extra help with some salt and liquid dish soap. Mix vinegar and salt in a pot. Heat to dissolve the salt. Once the salt dissolves, turn off the heat and let it cool. Once the mixture is cooled, add the liquid dish soap (ex: Dawn). Then, transfer the poison ivy killer into a spray bottle and spray the leaves of the plants. Because there is less salt in this recipe than in the formula mentioned earlier, it won’t be as potentially harmful to your other plants, but it is still a good idea not thoroughly spray your flower beds. Poison ivy survives year-round, even in the winter. However, the plant will start causing harm very quickly in early spring, when the sap begins to produce again. This makes the spring and early summer the worst times for those awful itchy rashes. And don’t forget, when you go out with your homemade poison ivy killer to make quick work of those poison plants, be sure you are wearing long pants and gloves (a plastic bag will also work in a pinch, but make sure there aren’t any holes). If you do find yourself with the beginnings of a rash, immediately stop what you are doing and go thoroughly wash the infected area with grease-fighting liquid dish soap, like Dawn. The dish soap will work to break down the toxic oils and sap. Follow up with soothing calamine lotion or something similar that works for you. Whether you are just looking for a weed killer that works or you are in desperate need of a reliable DIY poison ivy killer, we hope these tips and recipes came in handy. And remember, when you’re working on combating the poison ivy problem in your yard, safety first! 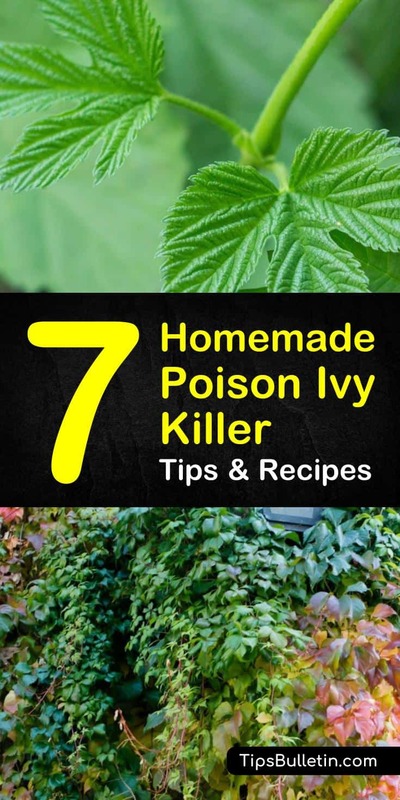 If these DIY poison ivy killer tips and recipes worked for you, please share these weed eliminating tricks with your friends on Pinterest and Facebook!